Silveira v. Lockyer is currently on appeal to the United States Supreme Court. 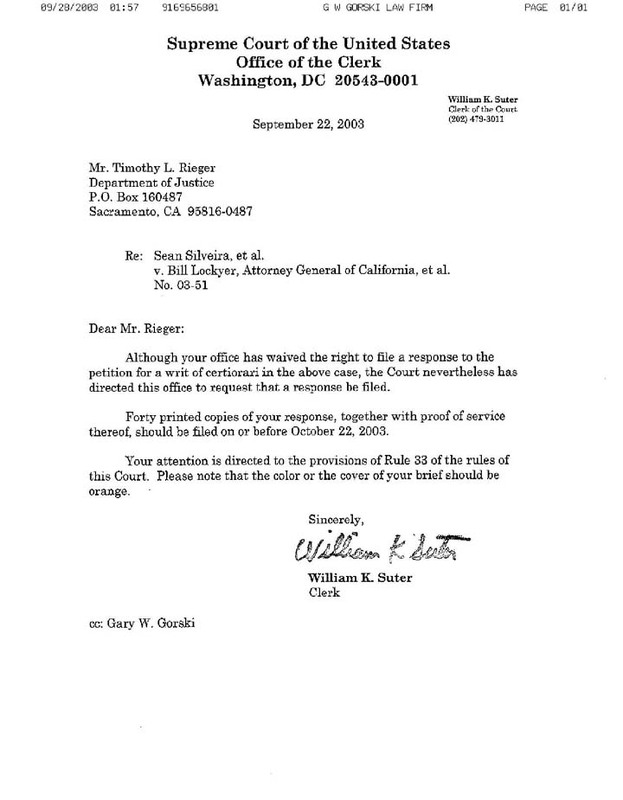 The Justices have a Conference on the case on November 26, 2003. We're hoping to hear on the following Monday that they will be hearing this lawsuit. If they do, it will be the first time in the history of this nation that a true Second Amendment case is argued and briefed on both sides by competent and informed counsel. This is the original complaint filed by California attorney Gary Gorski. It seeks to overturn California's ban on certain semi-automatic rifles based on the fact that the gun ban is a clear violation of the Second Amendment to the Bill of Rights. We're aware of certain minor problems in the complaint, and so is Mr. Gorski -- but the case is much larger than this complaint, as can be seen by careful study of the Certiorari Petition. This page includes links to media reports about Silveira v. Lockyer. The home page for Silveira v. Lockyer is http://KeepAndBearArms.com/Silveira. "The fundraising by KeepAndBearArms.com is essential to Silveira v. Lockyer and has my backing 100%."